Watch this video introduction to the most common use cases around machine data. 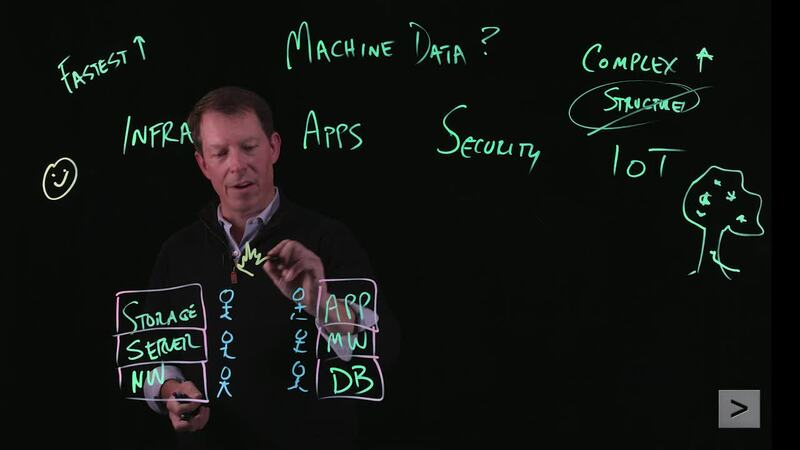 Splunk's Doug May breaks it all down in this nifty lightboard demo. Oh, and don't ask how Doug can write backwards. It's magic! Every environment has its own unique footprint of machine data. Here are a few examples. Amazon Web Services Security & Compliance, IT Operations Data from AWS can support service monitoring, alarms and a dashboards for metrics, and can also track security-relevant activities, such as login and logout events. APM Tool Logs Security & Compliance, IT Operations APM tool logs can provide end-to-end measurement of complex, multi-tier applications, and be used to perform post-hoc forensic analytics on security incidents that span multiple systems. Authentication Security & Compliance, IT Operations, Application Delivery Authentication data can help identify users that are struggling to log in to applications and provide insight into potentially anomalous behaviors, such as activities from different locations within a specified time period. Firewall Security & Compliance, IT Operations Firewall data can provide visibility into blocked traffic in case an application is having communication problems. It can also be used to help identify traffic to malicious and unknown domains. Industrial Control Systems (ICS) Security & Compliance, Internet of Things, Business Analytics ICS data provides visibility into the uptime and availability of critical assets, and can play a major role in identifying when these systems have fallen victim to malicious activity. Medical Devices Security & Compliance, Internet of Things, Business Analytics Medical device data can support patient monitoring and provide insights to optimize patient care. It can also help identify compromised protected health information. Network Protocols Security & Compliance, IT Operations Network protocol data can provide visibility into the network's role in overall availability and performance of critical services. It's also an important source for identifying advanced persistent threats. Sensor Data Security & Compliance, IT Operations, Internet of Things Sensor data can provide visibility into system performance and support compliance reporting of devices. It can also be used to proactively identify systems that require maintenance. System Logs Security & Compliance, IT Operations System logs are key to troubleshooting system problems and can be used to alert security teams to network attacks, a security breach or compromised software. Web Server Security & Compliance, IT Operations, Business Analytics Web logs are critical in debugging web application and server problems, and can also be used to detect attacks, such as SQL injections.